‘Take the fig tree as a parable: as soon as its twigs grow supple and its leaves come out, you know that summer is near. 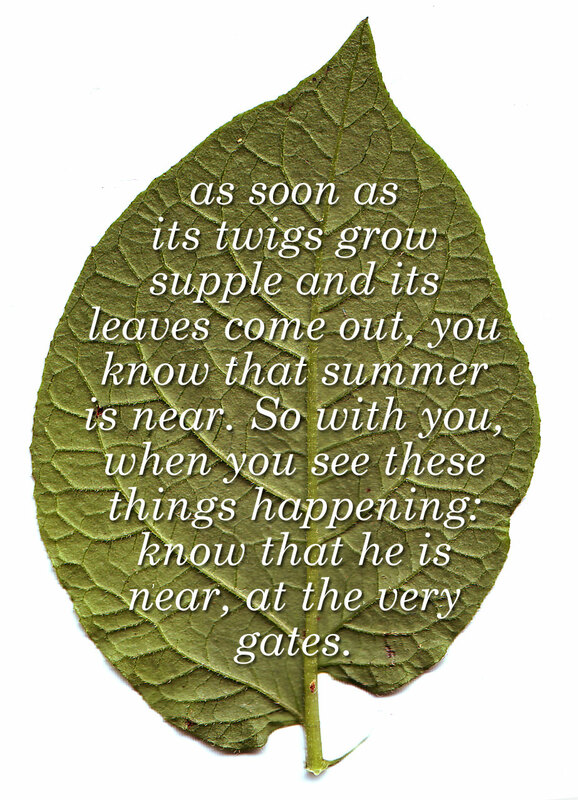 So with you, when you see these things happening: know that he is near, at the very gates. I tell you solemnly, before this generation has passed away all these things will have taken place. Heaven and earth will pass away, but my words will not pass away. The word of God is spoken in the human words of many people. In kindly words, in forgiving and tolerant words, and also in the word of God spoken in the Mass, Jesus speaks to us today. Like thepeople looking at a fig tree, we can find his presence in the kindliness and the helpful words of another. This is the word of God in human form. It will not pass away. God’s book of compassion and love…your name and mine is in it. Be thankful our are names are in the book of life. This entry was posted in Gospel of Mark, Gospel Reflection, Liturgy Resources, Prayer Resources, Scripture, Year B and tagged Consistent Care, Consistent Word, disciples, Donal Neary SJ, Gospel Reflection, Jesus, Love, Mark 13:24-32, November 16th 2015, parable, Scripture and Reflection for 33rd Sunday Ordinary Time Year B, Sunday Gospel Reading and Reflection, Teaching of Jesus.